well–formed.eigenfactor presents interactive visualizations to explore emerging patterns in scientific citation networks. The Eigenfactor project calculates a measure of importance for individual journals (the Eigenfactor score), measures citation flow, and creates a hierarchical clustering. Moritz Stefaner turns this information into a set of four information–aesthetic visualizations, each highlighting different aspects of the data. In visualizations of citation networks, both ball–and-stick–like network representations and maps are prevalent. This project extends the visual vocabulary on the one hand, by re-purposing existing techniques, such as radial-edge bundling and treemaps, and on the other hand, by inventing novel approaches like magnetic pins as flow indicators and an “alluvial” diagram to represent change over time in cluster structures. Citation patterns: a clean, yet organic radial network visualization that gives an overview of the whole citation graph. The radial-edge bundling technique effectively highlights the cluster structure and interdisciplinary citation links. Change over time: This stacked bar-chart diagram displays changes in Eigenfactor score and clustering over time. Clustering: Based on the squarified treemap layout algorithm, this visualization features “magnetic pins” to indicate both incoming and outgoing citation flow for any selected journal. 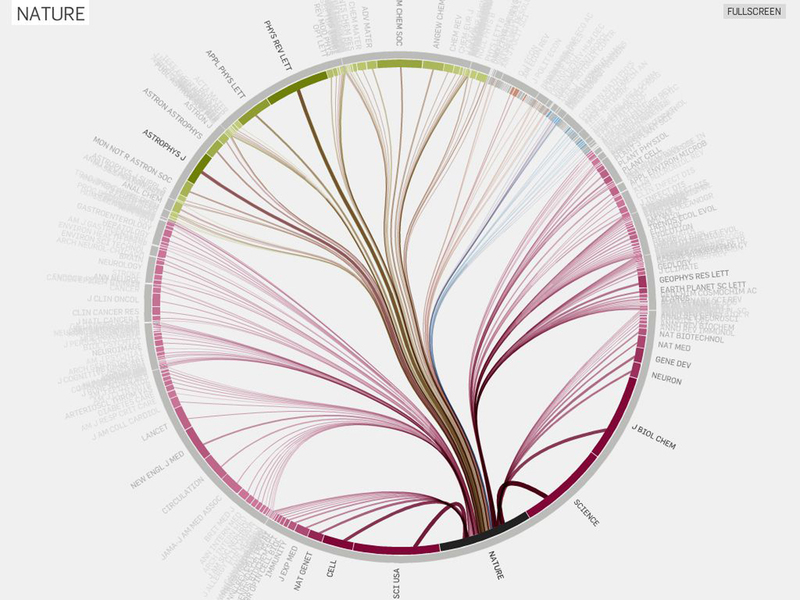 Map: This map visualization puts journals that frequently cite each other, closer together. You can drag the white magnification lens around to enlarge a part of the map for closer inspection. Data: A subset of the citation data from Thomson Reuters’ Journal Citation Reports 1997–2005. For the visualizations, 400 journals with their approximately 13,000 citation edges were selected, ensuring coverage of the top journals in each field.